OSWEGO — World-touring monks of the Drepung Loseling Monastery will promote peace and spiritual healing April 8 to 12 as they demonstrate “The Mystical Arts of Tibet,” performing colorful and musical rituals around their construction of a mandala in the main lobby of SUNY Oswego’s Penfield Library. 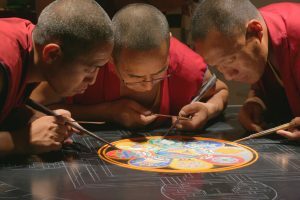 Monks of the Drepung Loseling Monastery work on a mandala, a circular sand painting with layers of symbolism and meaning intended as an object of meditation toward spiritual development and peace. The monks will construct a mandala April 8 to 12 in SUNY Oswego’s Penfield Library, complete with colorful rituals and informative workshops. All are free and open to the public. The week will culminate with the dissolution of the intricately designed, circular sand painting in an acoustically rich and moving ceremony starting at 3 p.m. Friday, April 12, in Penfield. The monks will lead the audience to the shores of Lake Ontario for dispersal of the sand, and guests will be invited to participate during the procession and ritual. Organized by Artswego, the college’s arts presentation arm, the weeklong event is free and open to the public. A companion mandala, designed by graphic design graduate student Asli Kinsizer, will serve as a template for members of the public to practice the ancient skill, using a metal funnel, the chakpur, to precisely add colored grains of sand. In the Buddhist tradition, the monks will utilize ritual, music and meditation to support the process of construction of the mandala. The week’s activities, as with the mandala itself, are intended to make for a layered spiritual journey encompassing family, community, environment and universal values such as peace and unity. At SUNY Oswego, the monks also will offer two public workshops, and a monk will train Artswego interns and other student staff to assist the public with the community mandala. * Mandala opening ceremony: noon Monday, April 8, Penfield lobby. The monks begin by consecrating the site of the mandala sand painting with chants, music and mantra recitation. Immediately following, the monks will draw the line design for the mandala. * Meditation and Focus for Stress Relief workshop: noon Tuesday, April 9, Penfield Room 215. * A Buddhist Approach to Working with Emotions workshop: Wednesday, April 10, Penfield Room 215. * Closing ceremony with procession to Lake Ontario: 3 p.m. Friday, April 12, Penfield Library lobby. The monks will sweep up the colored sands to symbolize the impermanence of all that exists. Dispersal of the sand in a body of water symbolically transmits the healing energies of the mandala throughout the world. The monks will work on their mandala — approximately 5 by 5 feet in size — from 10 a.m. to 6 p.m. daily on the main floor of Penfield, adjacent to the central stairway. They takes turns for breaks, and have provided Artswego with a list of dietary preferences: hot tea with milk and sugar, water, fruit juice, hearty and hot breakfasts, hot sandwiches (no pork or seafood) and salads — all of which the college’s Auxiliary Services can accommodate. Dining out, the monks prefer Indian, Oriental and American restaurants. Different groups of monks each year make the world tour with the endorsement of the Dalai Lama, who has been living in exile in northern India since escaping from Tibet following the Communist Chinese suppression of an uprising there. The original Drepung Monastery was established near Lhasa, Tibet, in 1416. It had four departments, of which Loseling, or “The Hermitage of the Radiant Mind,” was the largest, housing more than three-quarters of Drepung’s 10,000 to15,000 monks. After the Chinese invasion of Tibet in 1959 and the destruction of most of its 6,500 monasteries, some 250 monks from Loseling managed to escape that holocaust and rebuild their institution in southern India, according to the current Drepung Loseling’s website. Monks of Drepung Loseling have toured since 1988 to make a contribution to world peace and toward greater awareness of the Tibetan situation. University Police said they would waive enforcement of the campus parking-permit requirement on Friday, April 12, in Lot 1, the parking area adjacent to Walker Health Center and behind the library along Lake Ontario. Unless otherwise announced, parking in any campus lot requires a current SUNY Oswego sticker or a day-use permit. For more information, visit oswego.edu/parking. For information on all fine and performing arts events at SUNY Oswego, visit oswego.edu/artswego.